Most of the cases have been in dogs of all breeds, ages and sizes — although 10 cats have been sickened, too — after eating chicken, duck and sweet potato jerky treats. The pace of the reported illnesses appears to have slowed, but federal Food and Drug Administration officials are now seeking extra help from veterinarians and pet owners in solving the ongoing puzzle. “To date, testing for contaminants in jerky treats has not revealed a cause for the illnesses. “Despite these warnings, we have continued to receive reports of illnesses in both cats and dogs.” Martine Hartogensis, a deputy director for the FDA’s Center for Veterinary Medicine, said in the new report. The new numbers are up from some 500 deaths and 3,200 illnesses tallied in January, but the rate of reports has fallen sharply since then, mostly because two of the largest sellers of pet jerky treats announced recalls tied to the presence of unapproved antibiotic residue detected in the products. FDA officials don’t think that antibiotic residue is the big problem that has stumped the agency since 2007,instead, it’s likely that the recall of Nestle Purina PetCare Co.’s Waggin Train and Canyon Creek Ranch treats, plus Del Monte Corp.’s Milo’s Kitchen Chicken Jerky and Chicken Grillers home-style dog treats simply resulted in fewer treats being available. FDA officials remain as uncertain as ever about the source of the problem that has led to reports of illnesses possibility of Fanconi syndrome and other kidney problems in animals that ate jerky treats. Kendal Harr, a veterinary clinical pathologist who has been tracking the problem, says "I think that what it tells us is that the intoxicant is something that we're not used to dealing with as a toxin in North America." FDA officials are asking the vets to track and send detailed information about any animals sickened by jerky treats, including results of blood and urine tests. About 60 percent of reports cite gastrointestinal illness in the animals, and about 30 percent flag kidney or urinary troubles, the report said. About 135 cases of Fanconi syndrome, a specific kind of kidney disease, have been reported. At the same time that they’re seeking help from vets, FDA officials are putting out a fact sheet for owners that can be posted at veterinary hospitals, pet supply stores and other sites. The agency has repeatedly cautioned that the treats are not necessary for a balanced diet, but the warnings stop short of a recall. Because there's no formal recall, it's not possible to list affected brands, although a previous FDA analysis indicated that three of the top-selling brands of jerky treats sold in the U.S. were mentioned in connection with pet illnesses. 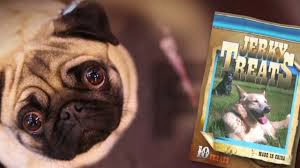 That doesn't sit well with pet owners like Robin Pierre of Pine Bush, N.Y., who contends that Waggin' Train chicken jerky treats were responsible for the sudden death in 2011 of her previously healthy 2-year-old pug, Bella, who developed kidney failure. She has long called for FDA to crack down on treat makers — and manufacturers. "I am disgusted that our government continues to protect corporate American and China," she told NBC News. "They need to start protecting the American consumer so that this does not happen again. As soon as a product is in doubt, a warning label should be placed at the point of sale so that consumers can make an educated choice." If a pet does become ill after eating the treats, FDA is asking owners to provide detailed information — up to and including results of a necropsy to test an animal’s tissues after death. In the meantime, officials are trying to reach pet owners who might still have treats on hand to make sure they know about the potential problems. “Right now, the focus for us is to make the public aware that these cases are still coming in,” she said.